Details relating to the Slovenian Commemorative of 2011. 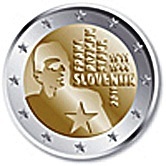 This coin honours the Slovenian national hero, Franc Rozman. Rozman was born in 1911 near Ljubljana. He was an underground fighter for the communist party. The motif is a stylized portrayal of Rozman. At the bottom of the inner circle is a large five pointed star – this represents Rozman’s membership of the communist partisan organization. In the top left quadrant is Rozmans’s name written vertically, followed by his date of birth and death “1911-1941”. Thereunder is the country SLOVENIJA and under SLOVENIJA is the year of issue written vertically. Return from Slovenian Commemorative 2011 to euro coin collector.